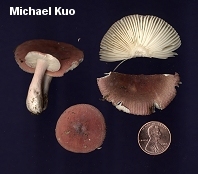 Small to medium size (the cap is usually about an inch or two wide), and fragile stature. Pure white spore print and gills. Mild taste and nondescript odor. 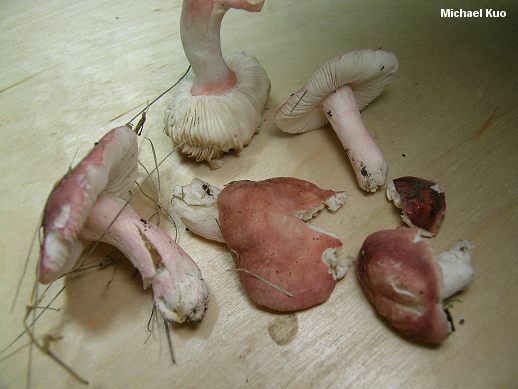 A dull pinkish red cap that is not mottled but sometimes has a darker center. A stem that is often flushed with the cap color. Habitat under hardwoods in eastern North America. If you have matched all of these features, the odds are high that your mushroom is Russula uncialis; microscopic details (see below) will help confirm your identification. Ecology: Mycorrhizal with hardwoods, especially oaks (but I have collected it in a lawn under shagbark hickory with no other trees nearby); growing alone or gregariously; often in grassy areas, and frequently found in lawns; summer and fall; eastern North America. Cap: 2-6 cm; convex, becoming broadly convex to flat with a shallow depression; rather thin and fragile; sticky when wet and fresh, but soon dry; smooth or finely dusted; dull pinkish red to blood red or rose red; evenly colored, but often with a slightly darker center; the margin becoming lined at maturity; the skin peeling fairly easily, often more than halfway to the center. Gills: Attached to the stem; close; a few forked near the stem; white; unchanging. 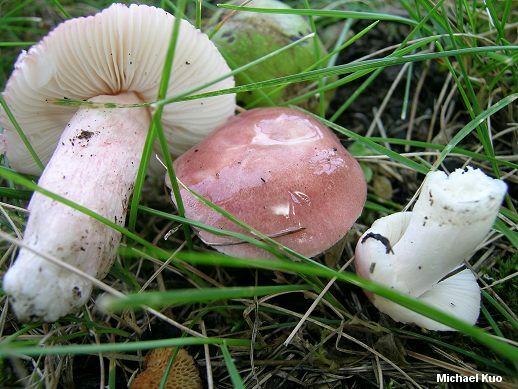 Stem: 1-5 cm long; up to 1 cm thick; more or less equal; smooth; white, often flushed with the cap color. Chemical Reactions: KOH on cap surface negative to yellowish or yellow; iron salts negative on stem surface. 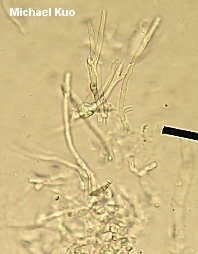 Microscopic Features: Spores 7-9 x 5.5-7 µ; broadly elliptical; with warts projecting under 1 µ; connecting lines scattered and sparse, not forming reticula. Pileipellis a hyaline cutis with hyphal ends rounded to subacute or elongated-fusoid; pileocystidia absent. REFERENCES: Peck, 1887. (Burlingham, 1915; Beardslee, 1918; Kauffman, 1918; Kibby & Fatto, 1990.) Herb. Kuo 06140304, 07120806.